The CSB Group iGaming team at their ICE stand in London. CSB Group has once again exhibited at the ICE Totally Gaming, one of the most significant gaming shows, in London earlier this month. 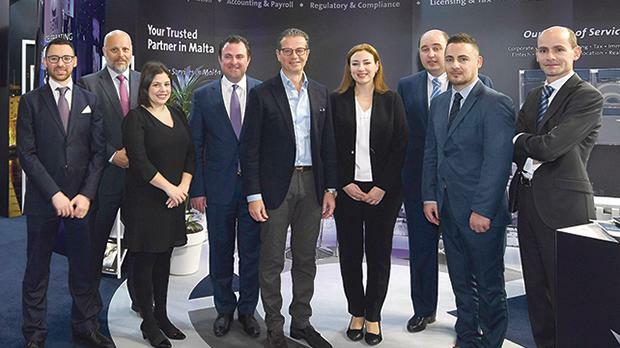 This was an opportunity for CSB Group director, Roger Strickland Jr and his team to meet visitors and promote Malta as a European gaming jurisdiction. The Malta Gaming Authority was also present at the show. CSB Group has been involved in the iGaming industry since its inception and offers a one-stop-shop solution to clients wishing to set up or relocate their iGaming operation to Malta. The group’s areas of specialisation include iGaming licensing advice and application support, corporate and tax structuring, accounting and payroll, fintech, regulatory and compliance advice, IT systems review and assurance, bank accounts and ePayment solutions, key function services, recruitment and work permits, serviced offices and real estate. The group’s associated brands co-exhibited at the show. These include VacancyCentre, a provider of complete recruitment solutions; Malta Sotheby’s International Realty, an estate agency with a vast portfolio of high-end residential and commercial property both for sale and letting; and Regus, a provider of flexible and professional workplace solutions. For more information, e-mail gaming@csbgroup.com or call 356 2557 2557.